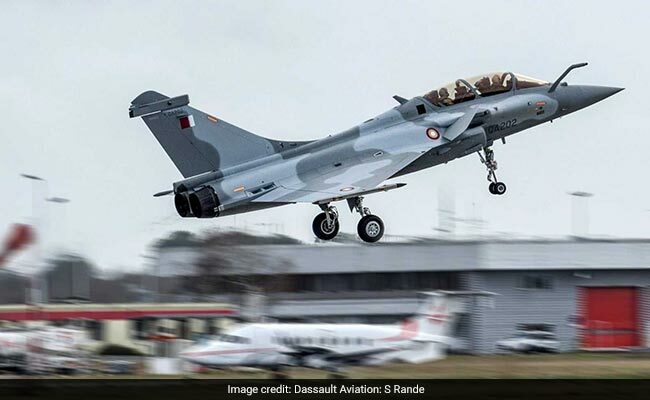 The Ambassador of France to New Delhi has denied that Pakistani pilots were trained France to fly the Rafale aircraft for the Qatari Air Force. This clarification comes after ainonline.com, an independent media firm which focusses on the aviation sector reported that ''the first batch of pilots trained for Qatar in November 2017 were Pakistani exchange officers.'' According to Jon Lake, the author of the piece, ''Escadron de Chasse 04.030 was established at Mont-de-Marsan as the Qatar Rafale Squadron on Oct. 1, 2017." Referring to the ainonline.com story, Ambassador Alexandre Ziegler has said, "I can confirm that it is fake news." French government sources have told NDTV that they have cross-checked details of this article. Qatar took delivery of its first Rafale at Dassault's Merignac facility on February 6 this year. In a press statement, Dassault had said Qatar had signed up for 24 Rafale fighters in May 2015. In December 2017, it ordered an additional 12 fighters. The deal for the first 24 fighters is valued at euro 6.3 billion. Qatar took delivery of its first Rafale at Dassault's Merignac facility on February 6, this year. In a press statement, Dassault had said Qatar had signed up for 24 Rafale fighters in May 2015. In December 2017, it ordered an additional 12 fighters. The deal for the first 24 fighters is valued at E 6.3 billion. Pakistani military personnel have been deputed to operate with the armed forces of several Middle Eastern countries for decades. Pakistan has also received military hardware from partner nations, including Jordan which has supplied Islamabad with 13 additional F-16 A/B fighters, some of which may have been used by the PAF during its attacks on Indian military targets along the Line of Control on February 27. In January 2018, the the Pakistani news portal www.thenews.com.pk reported the visit of the Commander of the Qatar Emiri Air Force to Pakistan Air Force Headquarters in Islamabad. Pakistan's Air Chief reportedly "offered support and cooperation in the field of aviation and military training" to his counterpart. This article will be updated if Dassault Aviation, France, chooses to issue a statement or clarification on the report carried by ainonline.com.